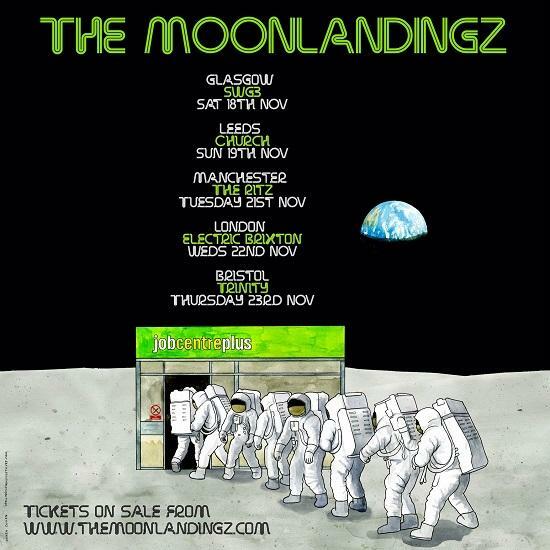 The Moonlandingz have announced their last run of live dates for the forseeable future, as they 'go back to fiction'. The band will play five headline shows across the UK, their largest to date. The dates are at the end of this article, and by clicking here, where ticket details can also be found. The band, formed by the Eccentronic Research Council's Adrian Flanagan and Dean Honer, were sparked from the ECC's acclaimed 2015 record Johnny Rocket, Narcissist & Music Machine... I'm Your Biggest Fan, which featured the then-fictional Moonlandingz woven into the record's narrative by narrator Maxine Peake. 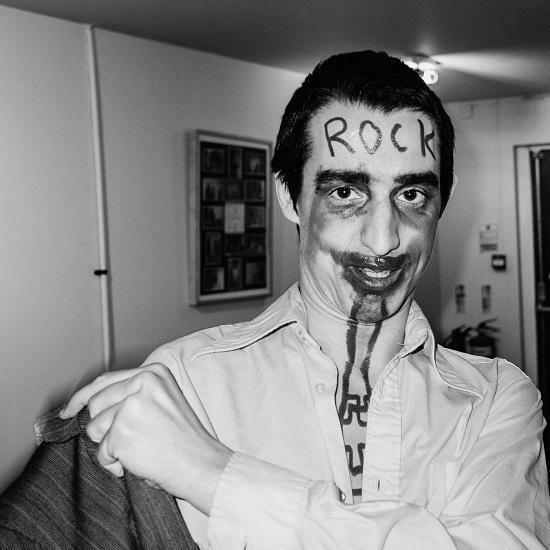 The band recruited Lias Saoudi of the Fat White Family to become the titular frontman Johnny Rocket as they made the steps toward reality with a host of frenetic live shows. In February The Moonlandingz released their acclaimed debut album proper, Interplanetary Class Classics, which was named as tQ's second favourite of 2017 so far in our mid-year top-100 last month. "We never really expected that things would blow up for us the way they have, I never in a million years expected to walk out (for instance) at the Glastonbury Park Stage over summer to anything more than a tractor and a handful of CatWeasel lookalikes in a K-hole, I certainly didn't expect to see smiling people as far as the eye could see. We seem to have tapped in to something that has been missing from so called Rock & Roll or pop music for a long time - just by being inclusive to our audience and bringing something that is both a little Wild but also very fun and timely to the people - its been a real joy for me to witness those effects from stage side. "However, this past year or two our feet have had no time to touch the ground, no time to even truly create anything new and to be honest that's what I and all the Moonlandingz people and their various projects live for, you know, creating some magic out of nothing in the studio, which ironically is the hardest thing to do when you're playing live all the time. You play 4 shows over a weekend, then need a couple of days to just feel normal again, before your thrown in the back of a van a day later, it leaves you with no time to be getting on with anything, especially as we all have our own other groups and musical projects, as great as it is to be busy or in demand it's a hard one to balance. "The likelihood is this will be our last tour for a while, we may do the odd one off show but we really do want to end what has been a great year on a high with a handful of big shows... I think once we've dredged our souls and put it in too something musically fresh with our other groups, then hopefully, we will reconvene for phase two in Moonlandingz world...for now though, we are going back to Fiction!"